Have you ever been on the receiving side of someone’s hatred? It is a powerful force that demands your attention. Hatred speaks louder than it can ever say because it is beyond disrespect. It is beyond a mere dislike or differing of opinion. It is a force that you can feel staring you straight in your eye. Feeling hatred from another human being is not one you can shake off so easily, especially when you experience it at a time when you are most vulnerable. Hatred is defined by http://dictionary.reference.com/browse/hatred, as “the feeling of one who hates; intense dislike or extreme aversion or hostility”. “Intense dislike or extreme aversion or hostility”. 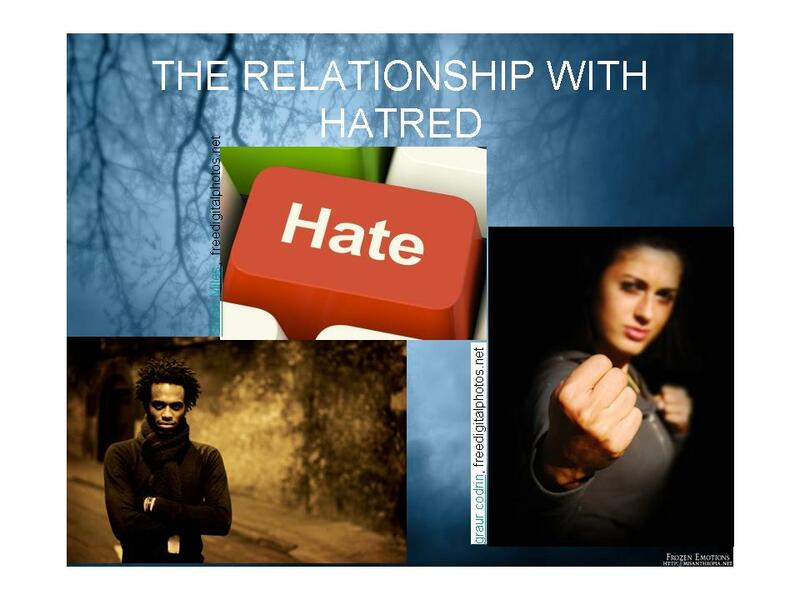 Hatred is not an instantaneous emotional action or response. It has taken time to incite the feelings of dislike and has allowed itself to morph into the extremity of hostility towards its object. The brewing of hatred takes great thought, much energy and effort to materialize. This means, while its object is laughing, living, loving and moving forward with life, the hatred incited for them in one person is being thought out, premeditated, contemplated, and given a lot of consideration and time. Hatred is hoping and waiting for the day when its object is near, in which to execute its wrath. Anyone who is hated by another person should understand that hatred lies in waiting. It is not just an off handed thought or fly by night feeling. Hatred works as a poison and holds internally to a boiling point, so when its object is within reach, it waits for a word that is spoken, any gesture or response, in order to justify its residence in the heart of the hater. The smallest word, behavior or act sets it off into a scene of dramatic animation that its object is not only caught off guard, but is also left to wonder where did all of the accusations and false delusions come from, and how can one person hold so much inside of their heart, mind, and soul. Hatred holding residence in the heart of any one person corrupts the heart and prohibits the ability to genuinely love. Hatred is a destroyer, and according to an article called, “Transforming the Three Poisons: Greed, Hatred, and Delusion” http://www.naljorprisondharmaservice.org/pdf/ThreePoisons.htm it says, “…our mind is neurotic, never calm, we are endlessly occupied with strategies of revenge”. This is a powerful thought. Being “endlessly occupied” wears on the mind, the spirit, soul, and even on one’s physical well being; which may be why many people who have hatred in their heart mostly always end up with cancer, some sickness, and maybe even having a need to be under psychiatric care or counseling. Hatred is so powerful of a force that even in the heart in which it dwells it is counterproductive to the hater’s physical well being. It is best when you encounter someone who hates you to not even try to reason with them. Just hold your position and watch them mindlessly rant and rave regarding their delusions or false accusations about you, because hate holds no ground for reason. It is a pure, unadulterated emotion that holds no objectivity or rationale. Defending yourself or trying to provide clarity is useless, because hatred has been waiting for the moment to have its time of confrontation with you. You will also find that if you try to make peace, just for the sake of trying to create a resolve, your gesture will be rejected with a back handed unreasonable response as to why peace cannot be made. Take note that the back handed response is pointed at you, because you are the object. Try not to take this personally. Hatred being worn by anyone, especially a person who claims to be a Christian or leader in the realm of Christianity is not only violating many laws and by laws of the Bible they claim to live by; but it is the opposite of everything they themselves claim God to be. In this instance, this makes them a hypocrite, a liar and not to mention a deceiver as it takes practice to construct a lie and delusions. It takes practice to build hatred in your heart. It is a premeditated act that clearly shows the hater’s hell on earth. And the place of hell in which they preach about is waiting for them when they close their eyes for the very last time. The relationship with hatred is a fate worse than death. This entry was posted in Self and tagged christians who hate, hate that destroys, how hate works, relationship of hatred. Bookmark the permalink. I’m currently experiencing this. It hurts so badly. I am also, which is why I am writing about it. Hatred has very little to do with you. It is borne, bred and fed in the hater. Please my friend Cruzan, do not internalize this. It is not your problem— at all. Talk to me. How can I help you with this as we both are going through this. I don’t know how you can help. But thank you for responding 🙂 The hatred has landed us in different states. You’re sooo right when you wrote that gestures of peace are rejected. I’m tired but I keep trying. The truth is, when the gestures of peace are rejected, it is clear the hater does not want to make peace. Unless peace is desired on both sides, it is impossible to have any resolve or make sense of whatever the hater’s problems are. In this case, you do what you can— until you find peace that you have done your best— then you move on.